We also recently hosted a French nun, Ani Lhamo, normally resident at the Drukpa European centre in Brittany, for a weekend of teachings on 'The Four Thoughts Which Turn the Mind From Samsara'. Ani Lhamo also led Shabten (long-life) accumulation practices for His Holiness's well-being, which are now a regular part of the centre calendar. We thank Ani Lhamo for her first teaching visit to London and for her enthusiastic and inspirational instructions. We hope she will return again later in the year. The Gyalwang Drukpa's first visit to the London centre - January 2008. With His Holiness due to visit the UK soon, it has been full steam ahead at Drukpa Kunga Peljor. The Shrine Room has been repainted a second time - now a glorious yellow. Drubpon Nawang has bought over intricately carved items for His Holiness's throne. One of our Sangha, Jigme Norbu Dawa (David Cranswick) is a professional artist who, as luck or karma would have it, specialises in painting using traditional materials. So he and Jigme Pelmo (Sandrine Blanc) have been working around the clock adding a dash of colour to these pieces using techniques that would have been used in Tibet traditionally. David says: Here's a short explanation of what we have so far done: Pigments: Lapis lazuli, Malachite, Azurite, red Lead, Vermilion, red earth, Naples yellow and Crimson. Malachite , azurite and lappis lazuli are all prepare from rocks. They are first ground to a powder using a mortar and pestle, then repeatedly washed in water until purified. They are then ground more finely on a stone or glass slab; after this they are then mixed with their medium and become 'paint'. All the pigments we use are traditional and prepared by hand. The first stage of the work is to seal the wood. After this an under painting is applied in a mix of white and red earth. This is especially beneficial for the gold, giving it more warmth and adding to its luminosity. Beneath all the areas where vermilion or crimson is applied one first paints a ground colour of red lead, this gives depth and heightened luminosity to the reds. Beneath the areas which receive the green malachite and blue azurite and lappis lazuli we first applied a layer of red lead and Naples yellow (an alchemical pigment which dates back to 7000 years ago) While grinding the azurite I noticed some impurities in the paint. This often happens during the grinding processes; I therefore had to repeatedly wash the blue in clean water, floating off the impurities. The azurite is a copper blue and, being more opaque, is an ideal base for the lappis lazuli (the most precious of all the blues). It was wonderful to see the afect of painting the lappis over the azurite, it gave the blue of the dragon such a richness and radiance. Pigments such as lappis which are ground from the rock are less fine than other pigments, they therefore need more care in the application and often require 7 to 10 layers. The under painting in red earth and other mixes took us almost two weeks, but the effort was worth it; a good foundation for the pure colours gives a luminosity and richness of colour that cannot be achieved by painting directly. It was wonderful to finally be able to apply these pure pigments, they seem to glow as if lit from within. Drubpon Lama Nawang will be visiting London again at the end of this month specifically to give a programme of teaching and practice in the new London Centre, prior to His Holiness's visit in January. Drubpon Lama Nawang appreciates that being mid-week these times are difficult for people who have to work but requested us to make a special effort. If it is at all possible to take a few hours off from our work by using holiday or flexi hours then we should do this but if it is not possible then of course you can just join the evening programme, which will start around 6.30 pm. Here are the details: Dates - Tuesday November 27th and Wednesday November 28th Times - 3 pm to 9.30 pm Venue - Drukpa Kunga Peljor, 5 Audley Square, London W1K 1DS Cost - Â£10 per day (Â£5 per session) The programme will be similar to last time and will inlude some Shine meditation as well as the usual practices and prayers. Please bring your Guru Yoga, Rosary of Jewels, Sengey Tsewa and Vajrayogini texts. will be visiting the UK in January 2008. He will be holding a public talk on "Live to Love", and giving teachings and initiation on Green Tara. Some details are as yet unconfirmed, but check the "Events with his Holiness" category for the fullest current information. 23rd January 2008 at 7pm Brunei Gallery, School of Oriental and African Studies (SOAS), 10 Thornhaugh Street, Russell Square, London WC1 Cost Â£15 (Â£10 concessions) payable on the door. No advance booking. The www.drukpa.org.uk website has been given a makeover. (you may have noticed). The structure is still developing, and some items are currently missing - the shop and photoalbum will re-appear soon. All the old content will be given the makeover treatment, and some new features will be added. First new feature is the event calendar, which also gives out an iCal feed. If you have a Mac or Outlook 2007 you should be able to subscribe, and new events will be automatically added to your diary. We are happy to announce that Drukpa UK now has a home in central London. 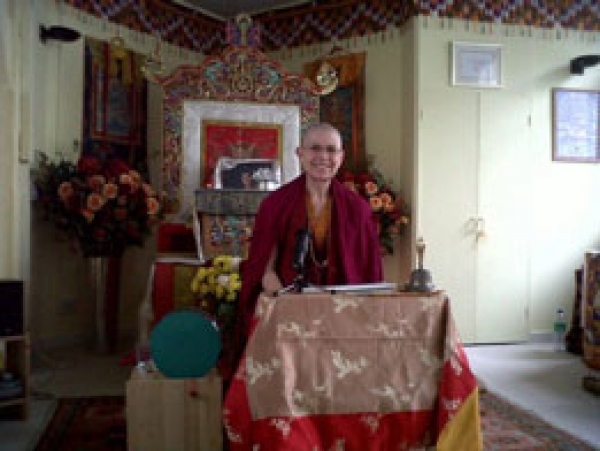 The Drukpa London Centre has been given the name Drukpa Kunga Peljör by His Holiness. Drubpon Nawang has given an outline for an increased practice schedule download a copy here. Directions to the centre can be downloaded here. This year (2006) marks the 8th centenary of the founding of the Drukpa Lineage by Tsangpa Gyare Yeshe Dorje. "800 years of hard work" as the current Gyalwang Drukpa puts it! Though Tsangpa Gyare was from the area of Tsang in Tibet, he was actually of Chinese (Gya) descent - his grandfather had helped bring the famous statue of Jowo Shakyamuni to Lhasa as a present from the Chinese Emperor to King Songtsen Gampo. He studied under Ling Repa, one of the great masters of the period, a generation after Gampopa and Rechungpa. Ling Repa had taught him much in accordance with the yogic practices of Naropa and Milarepa - the "re" in "Gyare" refers to his accomplishment of the tummo practice that allowed him to wander clothed only in a cotton cloth regardless of the external conditions - a "repa" or "cotton clad one". It was whilst on retreat sealed in a meditation cell at Lhodrak Kharchu, following Ling Repa’s passing that he acheived the supreme insight – his realisation of Mahamudra became vast and free. He then roamed from place to place meditating in sacred places. Lama Zhang, founder of the Tshalpa Kagyud, requested Tsangpa Gyare to take ordination in order to benefit more beings. Tsangpa Gyare saw himself giving teachings to many monks in a dream, and dreamt that the lineage of Lord Naphuwa would be held by ordained monks. Shortly afterwards, aged 33, he was ordained as a Bhikshu by Khenchen Zopa and given the name Yeshe Dorje. Donations are handled by Paypal but please note that you do not need a PayPal account to donate online. After clicking the Donate button simply choose the "Don't have a PayPal account? Click here" option. You will then be able to donate using your debit or credit card. Khenmo will be coming to Canterbury on Sunday 1st Feb 2:30 - 5:30 to talk about Compassion and the practice of Chenrezig.